Photo: San Juan’s El Convento hotel is offering “A Walk through History” winter travel packages. (Photo by Brian Major). Travelers in search of an escape from frigid winter weather and couples in search of romantic getaways are in luck as several Caribbean destinations are offering fall and winter travel packages. The packages feature discounted rates, special amenities and services and a wide range of activities. Several of the packages are specially timed to coincide with Valentine’s Day. Better yet, the packages provide vacationers with excellent opportunities to visit some of the Caribbean’s most sought-after destinations including Puerto Rico and Anguilla. San Juan’s Condado Vanderbilt Hotel recently held its grand opening following a $200 million restoration. Built in 1919 by Frederick William Vanderbilt, the hotel offers 319 premium guest rooms and suites, a spa featuring Puerto Rico’s first Hammam, two pool lounges with butler service, and an elegant restaurant helmed by celebrity chef Juan Jose Cuevas. The hotel’s “Rekindle by the Sea” packages feature ocean-view accommodations, daily breakfast for two, one 50-minute couples’ massage at the Vanderbilt Spa, and a romantic dinner for two. Package rates start at $607 per night. 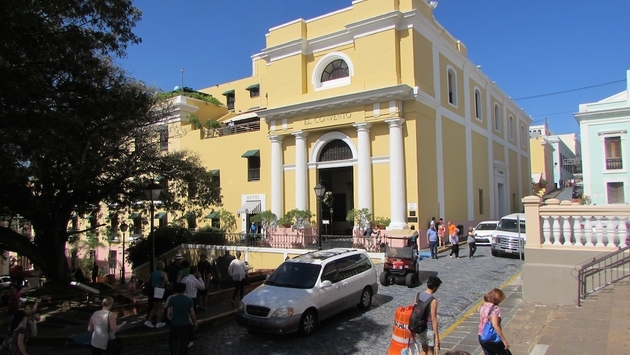 The 58-room Hotel El Convento in the historic Old San Juan district is housed in a 360-year-old former Carmelite convent and features a roof terrace, a plunge pool and Jacuzzi area with lounge chairs, three restaurants and a chapel. There is also an off-site beach club. This winter El Convento is offering “A Walk Through History” packages featuring “vista” accommodations, plus an El Convento tote bag filled with a map of Old San Juan, sunscreen, bottled water, and a takeaway snack). Guests who purchase the package will also receive invitations to a complimentary manager’s reception featuring wine and hors d’oeuvres on the terrace, a walking tour of Old San Juan for two, and complimentary admissions to Fort San Cristobal and Fort San Felipe del Morro. Packages are available through May 31, 2015 and nightly rates start at $235 per night. San Juan’s La Concha hotel has emerged as not only a mod-themed, upscale option in San Juan’s lively Condado district, but also a nightlife destination with one of the most popular lobby bars found anywhere in San Juan. The property also offers guests three outdoor pools and a private beach, five restaurants and a state-of-the-art casino. The resort’s “Naughty and Nice” package offers 15 percent off oceanfront accommodations, 20 percent off tours, 20 percent off a rental car, 20 percent off meals at the Voga Restaurant, plus a Naughty & Nice kit featuring Don Q liquor with mixer, chips, water and sunscreen. Rates under the package start at $259 per night. Other Puerto Rico hotel and resorts offering winter packages include the Copamarina Beach Resort & Spa, which is offering “This One’s for the Girls,” a package featuring accommodations, daily breakfast for two, a choice of a manicure or pedicure, and a beach bag. Rates start at $275 per night. The Doubletree by Hilton San Juan is offering a “Sweet Treats” package featuring fresh baked chocolate chip and walnut cookies at check-in, handmade gourmet chocolates, complimentary breakfast, free parking, and admittance to the Puerto Rico Museum of Art. The packages are available through March 31, 2015, with rates starting at $179 per night. Finally the Isla Verde Beach Resort is offering “My Puerto Rico Experience,” a package featuring a 20 percent discount off car rental, a 20 percent discount off excursions from Dragonfly Adventure Tours, and a $75 resort credit per stay. The package is available through Dec. 21, 2015; rates start at $185 per night. One of the smallest islands in the entire Caribbean, Anguilla is offering some big savings this winter as several luxurious hotels and are offering packages timed to coincide with Valentine’s Day. For example the Anacaona Boutique Hotel is offering “Amorous Anacaona Honeymoon” packages featuring seven nights’ accommodations for two; champagne and a welcome rum beverage upon arrival; daily continental breakfast; three dinners for two in the hotel’s Firefly Restaurant, a day trip to Sandy Island, and a 60-minute massage for two. The packages start at $2,185, double occupancy. Anguilla’s luxury Cap Juluca Resort is offering two couples’ packages for 2015. “Just the Two of Us” is intended for intimate weddings while “I Still Do” is designed for vow renewals. Both packages include use of a beach or lawn venue, officiate services, a photographer, a three-course dinner for two on the beach, champagne and a wedding cake. “Just the Two of Us” prices start at $6,852 and include a three-night stay. “I Still Do” starts at $4,245 and includes a three-night stay. Winter packages at the CuisinArt Golf Resort & Spa are built around the resort’s Venus Spa. The “Ladies Pampering” and “Gentlemen’s Rendezvous” packages each feature a 80-minute treatment including a hydrating facial, a conditioning scalp massage and a classic body massage for $185. At the Frangipani Beach Resort, a “Honeymooners’ Paradise” package features six nights in a one-bedroom suite, a bottle of champagne, a sunset cruise and a beachside couple’s massage. The package starts at $3,600 and includes daily continental breakfast at the on-site Straw Hat Restaurant. Also the Viceroy Anguilla is offering packages for couples having large destination weddings as well as smaller, more intimate nuptial gatherings. Viceroy’s Love & Legacy package is designed for groups of at least 100 adults staying for three nights and starts at$500 per person. The Love in the Sky package is designed for couples who book six roundtrip seats on a Tradewind Aviation flight from San Juan to Anguilla with complimentary seats on the same flight. Two other Viceroy packages, Love is Simple and The Elegance of a Vow, are designed for couples-only ceremonies. Both include a wedding ceremony, a dedicated wedding specialist, and a three-course dinner for two at the resort’s signature restaurant Coba. The packages are priced at $4,200 and $4,800 respectively, and include personal assistance with the marriage license and certificate service.